I’m not sure this qualifies as a clinic or not, but I wanted to share a recent experience that gave me such a boost of excitement for music education, and the legacy we all contribute to as music teachers. I was commissioned to write a march to honor a band-directing icon in the state of Florida, John DeYoung, who has been active in music education for over 50 years. He was the long time band director of the Bartow High School Band in Bartow, Florida, along with serving as the conductor of the Bartow Adult Concert Band, president of the Florida Bandmasters Association, president of the Florida Music Educators Association and a hall-of-fame member of both organizations. He truly was and continues to be the “Music Man” in the town of Bartow. 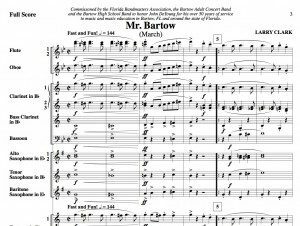 So much so, they call him Mr. Bartow, which was the inspiration for the title of the march I have just written in his honor! When we met to discuss the piece, John expressed his love for the marches of Henry Fillmore. He said, “Fillmore’s marches are happy music.” It is obvious John is an upbeat, happy and positive man, and I tried very hard to write a happy march in John’s honor. He’s happy because he has loved his job for all of these years, and the joy that he brings to life and to his teaching is what made him the icon he is today. My point is the music profession has a lot of icons like John DeYoung. They are role models for how to live our lives, and how to inspire and teach young people the joy of music. I think it is very important that we honor these legends in our profession, and most importantly, listen to their stories of how they accomplished so many things. More often than not, you will hear about all the countless hours of the hard work they put into their jobs, but that it wasn’t hard for them because they loved it so very much. We all can learn from the passion these role models have shown in their careers. So, if you ever get the opportunity to talk to an “old-timer” in your area of the world, take advantage of it. You will be surprised at what you can learn from them. Better yet, if they are still able, let them work with your ensemble and let your students see the passion and wisdom in these great people who have paved the way for us all. Become a legend to your own students. Show them your passion for music, and know that you are affecting the lives of young people everyday. You are creating your own legacy, and don’t ever take that responsibility for granted. I feel truly honored to be able to do the things I do, and to get a chance to honor folks like John DeYoung. I can tell you that I learned a lot from John in the process: how to live a life well and to be passionate about music. I know you can too, from the legends of music education in your “neck of the woods!” Good luck!